Dress up your look in comfort with classic big and tall banded-bottom shirts! The sweater band bottom adds the perfect finishing touch to this versatile shirts, which is available in your choice of long or short sleeves. Popular with the big and tall guy, our big and tall banded-bottom shirts can be worn out for additional comfort, while also flattering the tummy area. Our most popular brand of big and tall banded bottom shirt comes from Lord Daniel Sportswear, a highly in-demand supplier for most retailers in this category. These versatile shirts look great year-round as they are made of a comfortable blend of polyester and cotton. The available weights of these fine shirts reflect the changing seasons with lighter weight fabrics that are just right for spring and summer and the heavier fleece fabrics that you will need for fall and winter. 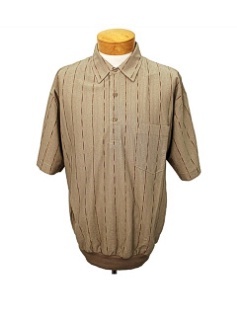 Long-sleeve big and tall banded bottom shirts are available as well, and are most popular in the coldest climates. Please pick your size. Want Long Sleeves, Click Here.